The health benefits of apple cider vinegar are numerous and well documented but, for many people, it boils down to one simple fact; they don't like the taste. 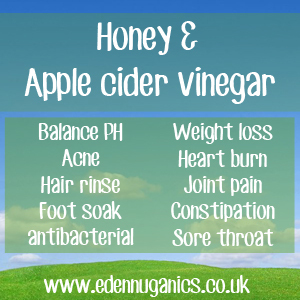 ACV has a sharp, somewhat tart flavour I have come to enjoy over the years but sadly, many people struggle with it, often giving up on this remedy after just one or two days and missing out on the amazing benefits it offers. But what can be done to make apple cider vinegar more palatable? One of the most popular ways to balance out the bitter flavour of ACV is to mix it with Honey. This not only sweetens the taste but also offers additional health benefits, including a powerful antibacterial action. Manuka - Manuka Honey is a highly medicinal Honey that is produced in New Zealand. The bees that pollinate the Manuka trees feed only feed on this species, giving their honey an amazing array of benefits. Some of the key components of Manuka Honey include naturally occurring Hydrogen Peroxide as well as an antibacterial substance known as Methylglyoxal. The potency of Manuka Honey is measured on a scale known as Unique Manuka Factor (UMF). Organic Honey - Although sadly lacking some of the unique benefits of Manuka, Organic honey is still a great tasting natural sweetener that offers a range of benefits including antibacterial and antifungal properties. In addition, Honey also contains powerful antioxidants that help to protect from oxidative stress caused by free radicals. Organic Honey is packed full of HEALTHY slow Carbohydrates. In fact, it can offer our bodies as much as 17g of Carbohydrates per tablespoon. Honey is known to reduce the frequency of coughs in children suffering from colds and influenza (flu). Honey has been historically used for thousands of years to treat insomnia, weakness and fatigue. Blackstrap Molasses - If Honey isn't your thing another great option for sweetening apple cider vinegar is Blackstrap Molasses. Blackstrap is a by-product of the sugar cane refining process. This thick, sweet syrup has a low glycemic load of 55 making it a much better choice than refined sugars, especially for people with diabetes. The antioxidant effect of Blackstrap Molasses can help to protect from damage caused by free radicals. Molasses is an extremely dense source of minerals including Selenium, Calcium and Potassium. Blackstrap is known to help detox the Colon. This is in part due to it's high concentration of Calcium. Firstly, we are going to want to warm up some water, although be sure not to allow the water to get too hot as this will damage the enzymes found in the Vinegar. The next step is to pour a little warm water into a glass and stir in two teaspoons of your chosen sweetener, the heat of the water will help to distribute the Honey evenly and ensure there are no lumps. The next step is adding raw, unfiltered apple cider vinegar into the glass. I normally add around 3 tablespoons but you can start with less and work up to a stronger brew. Be sure to give the mixture a quick stir, and that's it. A simple, tasty drink that heals and protects our bodies. What conditions can this be used to treat? As you can see, there are many reasons to try this traditional health tonic. With the added benefit of Honey or Blackstrap Molasses to sweeten the deal, this could well be the remedy to keep you and your family healthy through the colder winter months.